I've spend the past few days decorating my humble abode, getting it just right for the holidays. Stockings hung with care, wreaths on the doors, festive lights outside. The whole nine yards. It's the holiday season once more. Wishing you Joye and all Goode Cheer at Hogswatchtime & All Through The Yeare! What, you don't know what Hogswatch is? What do you mean you've never heard of the Hogfather? He brings toys to all the good little girls and boys. He has a sled pulled by four massive tusked boars! Who is this "Santa" you speak of? 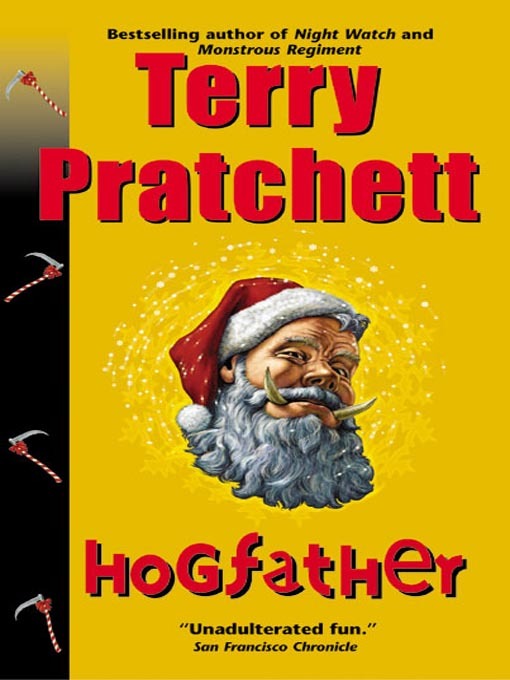 Hogswatch is the brain child of awesomely puntastic author Sir Terry Pratchett and his lovable and enormous Discworld series. Pratchett has been writing Discworld novels since 1983 and there are over forty of them. This twentieth novel in the series, Hogfather, is an absolutely genius satire about Christmas and it's my yearly holiday read. It just isn't the holidays until I'm reading a book about Death trying to be Santa and failing miserably at it. It's nearly impossible to give a short and sweet summery of the Discworld universe. It's incredibly intricate and all interwoven. The important parts are these: the Discworld is a flat world that is carried on the backs of four elephants who stand on the back of the great turtle A'Tuin, who travels through space. On this strange, flat world are people who are all basically out of their minds. One of those wonderful characters, and the most beloved by fans, is Death himself. HE SPEAKS LIKE THIS and has a certain ennui about his job. He tries to do other occupations with varying degrees of success. Being the Discworld's answer to Santa is perhaps his funniest outing. The book isn't only about Death. There is Mister Teatime (pronounced, as he often reminds us, "Teh-ah-tim-eh"), a demented member of the Assassin's Guild who is given the task to try and kill a mythological holiday figure. There is also the awesome Susan Sto-Helit, a governess with a shady past who, with much exasperation, goes to help save the day. 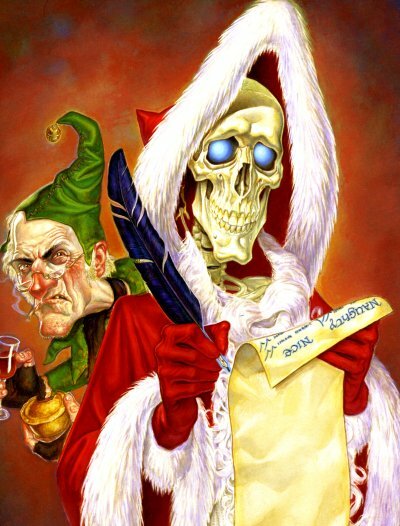 A yearly reading of Hogfather is my holiday book tradition. Do you have one too? I also must read Hogfather every year. Also Christopher Moore's The Stupidest Angel. I must watch all the classic Christmas cartoons as well as Muppet's Christmas Carol. The Stupidest Angel for me! I've been looking for a good chance to comment for the first time - this is definitely it! Just a thank-you; I nearly forgot Hogfather on my list of holiday things. It was my first experience with Terry Pratchett (but I'm ashamed to say I watched the movie before I read the book). Did ya'll know, Terry Pratchett is promoting this post on Google+?